Mako Web Designis located in Sarasota, Florida. Founded in 1998, we now have more than 10 years experience in website design and development. Mako Web Design Sarasota specializes in giving businesses an online presence with the right look, hook & functionality to be competitive in today’s increasing online market.Mako Web was created in 1998 by Bernie Clark in Michigan. We started creating e-commerce websites when Internet e-commerce was just getting started. Mr. Clark had started developing websites in 1996 for his own purposes and started an online store in 1996. WYSIWYG editors and online store builders were not available yet so he had to learn web programming the hard way. As a C, Fortran and Pascal programmer, HTML was just another language to learn. 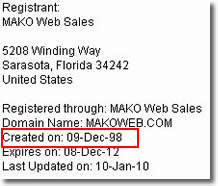 Mako Web went on to develop many business and government websites in Michigan and started acquiring clients around the US. In 2004, we moved the business to Florida, and we are now a full-service web design and development company offering design, analysis and reporting, architecture, programming, internet marketing, and maintenance plans all designed to ensure our clients’ online success. Bernie Clark became fascinated with programming at an early age. He began working for General Motors Corporation in 1978 and started programming in MSDOS, before Windows, in 1985. While working for GM, Bernie was instrumental in installing the first broadband cable system in the history of the industry. Bernie also programmed the first paperless assembly management systems in Fortran, was involved in building the GM plant Intranet which facilitated employee safety training, developed GM’s first skilled trades electronic purchasing system which resulted in millions in cost savings and programmed many other applications for GM using Pascal and then the Object Oriented Language C++. Bernie also developed Oracle PL/SQL code at GM (including triggers, stored procedures and packages). Bernie continues to ride the wave of technology as he is always the first one out to surf. And although he is adept in all programming languages, he has great appreciation for the ease of application that social media platforms bring to the world of technology. He is always looking for a way to maximize capability and is consumed with finding new solutions to ageless marketing challenges. Bernie is now developing Facebook Aps, Mobile Aps, WordPress Plugins, consumer interactive gaming experiences and integrating Twitter and You Tube into interactive media platforms. Bernie enjoys continuing education and boasts significant certifications. He is currently the world’s only Certified PayPal and Certified Authorize.Net Developer as well as an SEO expert, with the credentials to prove it.